b) the dogs must be COMPLETELY dried before using the clippers- this insures that you have the best use of the clippers as they won’t go smoothly through a dirty coat. this can result in an uneven cut and/or dull the blades. 2. You are welcome to bring your own blades to use on our clippers, then you don't have to wash your dog at all. 3. The dogs must be completely dry for the clippers to work. If the dog is even damp, the blades won't go through the hair. If you don't have time to dry them completely, we offer a "clipper pass" which allows you to wash your dog on one day, and come back within 3 days to use the clippers. 4. We only offer two blade sizes: #10 and #7 and they leave the hair on the dog 1/16 of an inch and 1/8 of an inch, respectively. If you want to leave the hair on your dog longer, we suggest that you have a groomer take care of it for you. 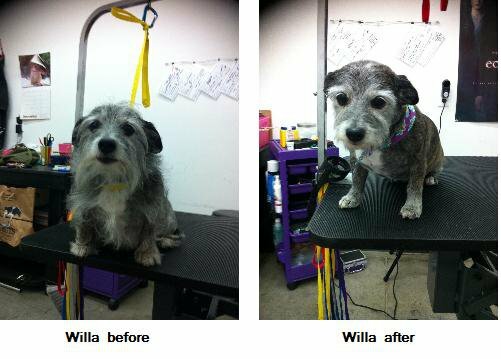 Here is Miss Willa before and after her groom. Doesn't she look sharp? The blade used on the body was a #7. 5. This is not a fast process-depending on the size and breed of your dog, it can take up to 4 hours to complete. As with all of our self-serve services that we offer, it is based on a first come, first serve basis. Know that you may have to wait, especially if you come on the weekend. If you have any other questions, please feel free to email us, or call one of the shops.